Landslide and rockfall events belong to a class of geological phenomena which occur rapidly, contradicting our believes of geology occurring only on large time spans, and for this and the often catastrophic results they are widely recognized even by non geologists. Especially native people in mountain ranges, like the Alps, know rockfall events and their aftermath. Fig.1. Landslides in the Alps after ABELE 1974 with mentioned sites. Myths in the Alps often refer to landslides as punishment for greedy people, the mountains punish the village or man who denied help to others by entombing it alive. In historic times documented landslides in the Alps are reported from the Roman Tauredunum (exact location unknown, but presumably Wallis, Swiss) and from the Lavini di Marco (Italy) in 833 A.D., Mont Granier (France) in 1246 A.D., Dobratsch (Austria) in 1348 and Plurs (Swiss) in 1618, to mention some examples. Fig.2. 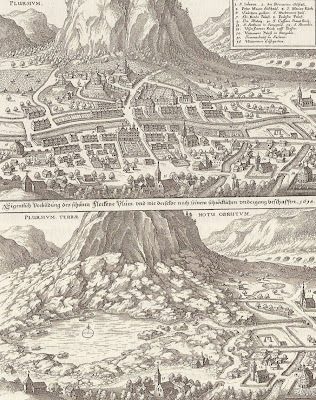 A strong precipitation event caused in 1618 the landslide that destroyed the Swiss city of Plurs (Cantone Graubünden). Figure from BEHRINGER 2007. 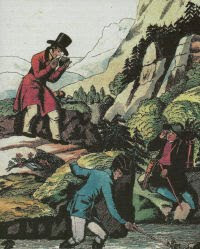 The first scientific considerations on landslides were published by BERTRAND in 1757, who studied especially the relationship between landslides and earthquakes, and BEAUMONT in 1806, who in a description of the region of Savoy (France-Italy) includes also landslides and their deposits. The landslide catastrophe of Goldau in 1806, where an entire village was destroyed and 457 people killed, was described in detail by ZAY (1806). Fig.3. The Goldau rock slide on September 2nd. 1806 at the Rossberg, Cantone Schwyz, Switzerland. Painting by H. Keller 1806. Figure from THURO et al. 2005. In 1807 ESCHER completes a first inclusive list of historic landslides in Swiss. 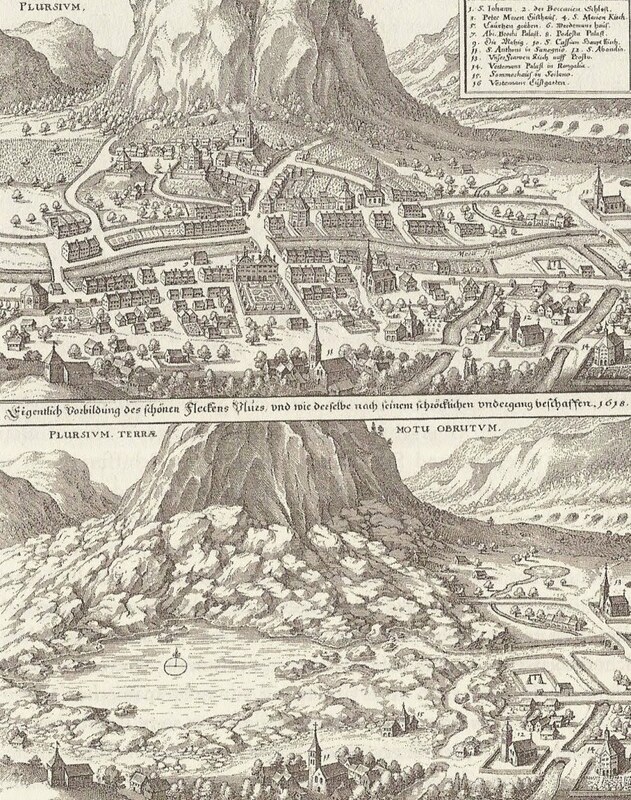 In his "Geschichte der durch Überlieferungen nachgewiesenen natürlichen Veränderungen der Erdoberfläche" (History of lore on the proven natural variations of Earth's surface) HOFF (1834) extens the list to the entire Alps. In the Eastern Alps the study of landslide morphologies is carried out some years later, with pioneering work by SCHAUBACH (1845-1847) and BALTZER (1847-1875 and 1880). The catastrophe of Elm in 1881, where a landslide was triggered by unsafe quarrying of schist and caused the death of 115 peoples, enforced the scientific study of landslide in relationship to men's activity and safety, an important contribution in these times is appropriately denominated "Bergsturz und Menschenleben" (Landslide and human life) (HEIM 1932). 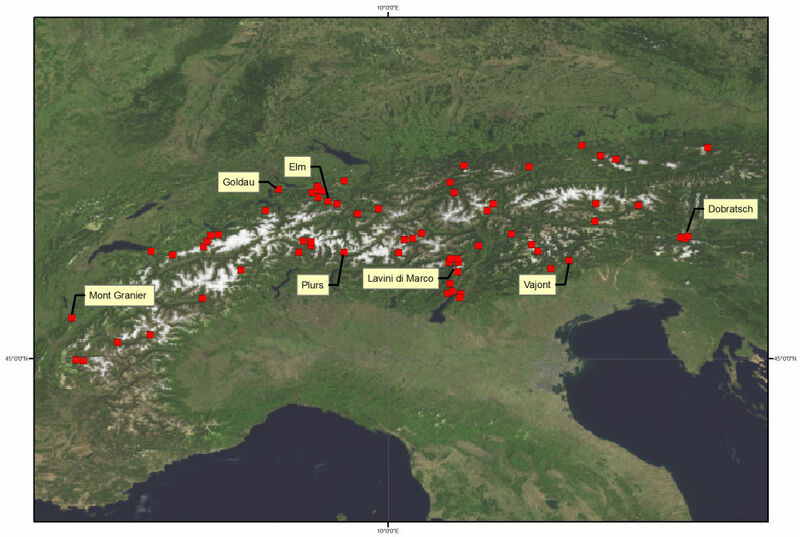 The first half of the 20th century sees the compilation of a register by various authors of landslides on a regional scale, most time for single mountain groups in the Alps. But in the same period the interests of geologists and engineers shifts to slow mass movements, like slope deformations, better studied and understand at these times. This situation , like before, changes with a human induced catastrophe in 1963. The tragedy of the landslide of the Vajont, resulting in more than 2000 victims, shifts back the interest to the research on rock mechanics and fast occurring mass movements. One of the more recent and classic works important for the alpine geology is the work by ABELE 1974 "Bergstürze in den Alpen" (Landslides* in the Alps). All the mentioned publications are prevalent of descriptive character, mapping the extent of landslide deposits, characterising their morphology and their relationship to other geomorphologic features, but only the last years have experienced a increase of our understanding of the mechanism of landslides-initiation and movement. With the development of geophysical survey methods it is possible to look into landslide deposits, with new dating methods it is possible to date such deposits, and interfere "periods" of landslide activity and possible triggers occurring at these times, with the advancement of computer models large landslide deposits can be simulated and compared to features observed in the field. *The German term Bergsturz (mountain fall) is not completely synonymous to the English term landslide - it is defined as movements of rocks or debris at high speed (that can include falling and/or gliding) with a volume exceeding 1 million cubicmeters and covering an area of more than 0,1 km2.